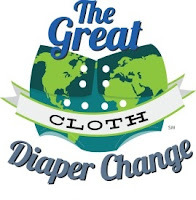 The Great Cloth Diaper Change 2012 is coming! Will you be there? Join the cloth diaper community on April 21st, 2012 as we attempt to break the world record for the most cloth diapers changed at one time! Last years stats for 2011: A Guinness World Record was set for the most cloth diapers changed simultaneously with 5,026 participants at 127 locations in 5 countries. The total number of participating hosts (not all qualified for the GWR) reporting were 203 with 6,363 participants from 10 countries! $5,167 was donated to the Real Diaper Association. For more details watch this cute informational/promotional video below.